We are very lucky in my hometown to have a very active Farmers Market, with several markets around town throughout the week. The biggest and best one is on Saturday morning, in the back of city hall. Its very well organized with farmers/produce vendors all down one row, crafts and such down another, people selling plants and flowers down another, and food vendors spread in a big arc around them. I haven't been great at taking pictures of what we come home with but I'm always happy when I do, all the food is so beautiful! 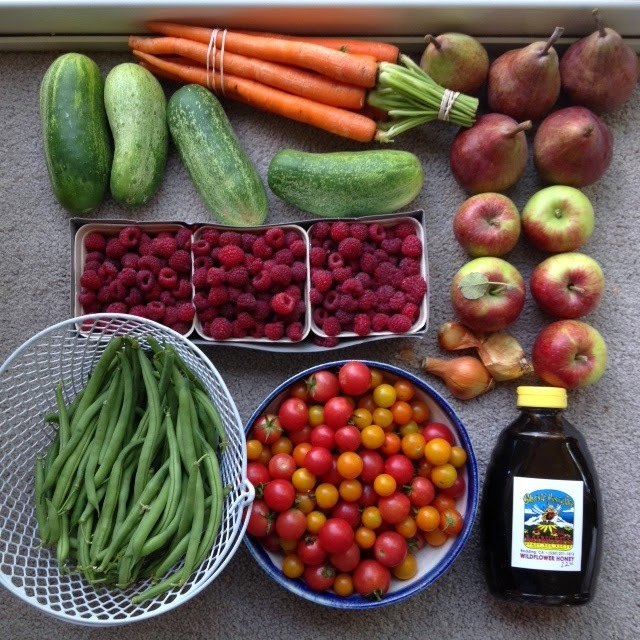 Carrots, cucumbers, pears, apples, honey, shallots, tomatoes, greenbeans, raspberries. This week, lots of basil (to dry for gifts) leeks, garlic dip, garlic, grapes, carrots, honey (also for gifts) cucumbers, apples, tomatoes, raspberries. This summer, Raspberries have taken the place of strawberries. Something must have happened to the strawberry farms because there haven't been any good strawberries ANYWHERE. Which is a huge disappointment since Marm and I both love strawberries. I usually only post outfits when I'm a bit more dressed up, but this tends to be what I look like more often. T-shirts, flats or sneakers, a skirt, and a side braid. Payless is having their BOGO sale, so I treated myself and bought 3 new pairs of shoes, these pink ones, some cobalt blue ones, and a glittery gold pair to wear to a friends wedding. I had just thrown away all my yucky flats from last year so it was perfect timing! 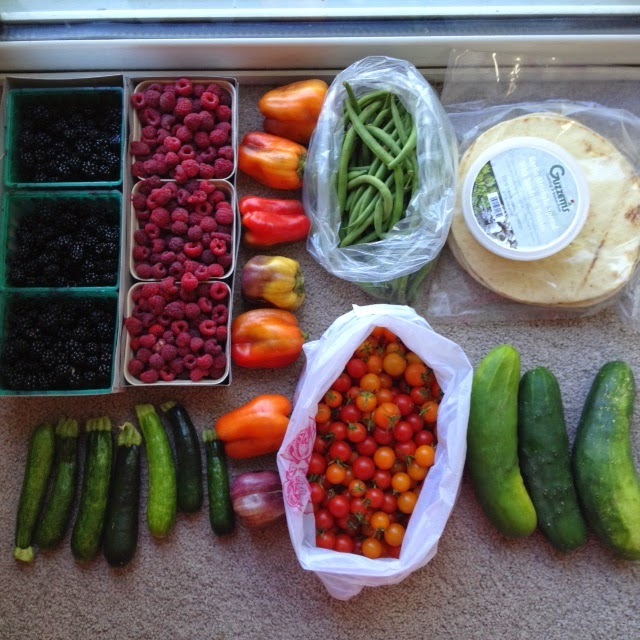 What are the farmers markets like where you live? Good? Great? Are you extra lucky with a garden at home?